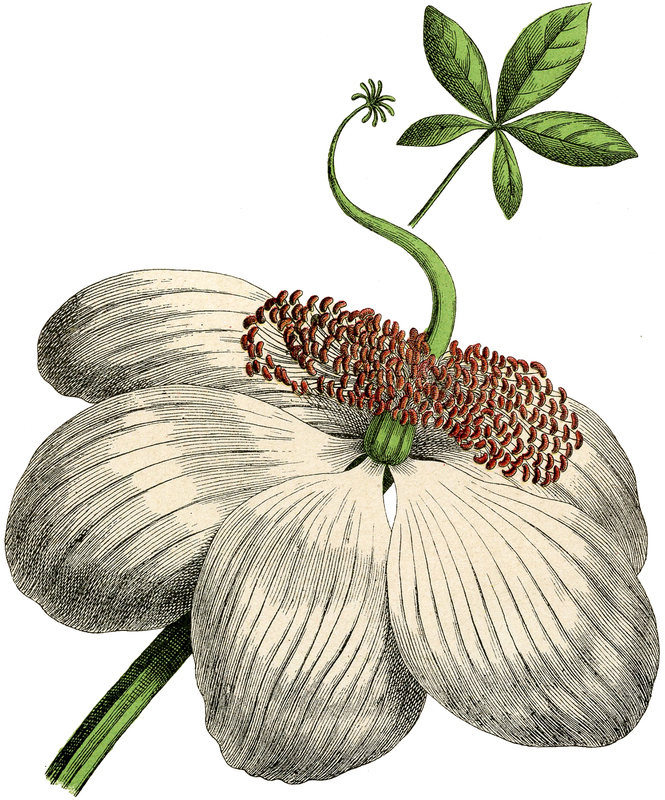 Today we have a simply exquisite collection of White Botanical Flower Images – FREE to you! Typically engravings, botanical art is so beautifully detailed and expertly drawn down to the tiniest part. I especially love the delicate root systems. The antique prints are such an attractive way to decorate your home. Each of these creamy flower prints is framable as is. The entire White Botanical Flower image collection would make a delightful wall grouping on a focal wall. The images are nice to use in your Mixed Media or floral Craft or Collage Projects! I think they would make an interesting floral junk journal cover or cards. These were all scanned from a Circa 1887 German Plant book in my collection. Today I’m sharing this Retro Creamy Five Petal Flower Botanical Image! This delightful botanical illustrates a plant with a large cluster of elongated, rounded leaves at the base of a thin stem covered with tiny cream-colored flowers with stamens that resemble a retro clock. You know the ones with long arms ending in little ball shapes? Above is a vintage Teardrop Petal Flower Botanical Image! These cute flowers have light creamy petals in the shape of teardrops. 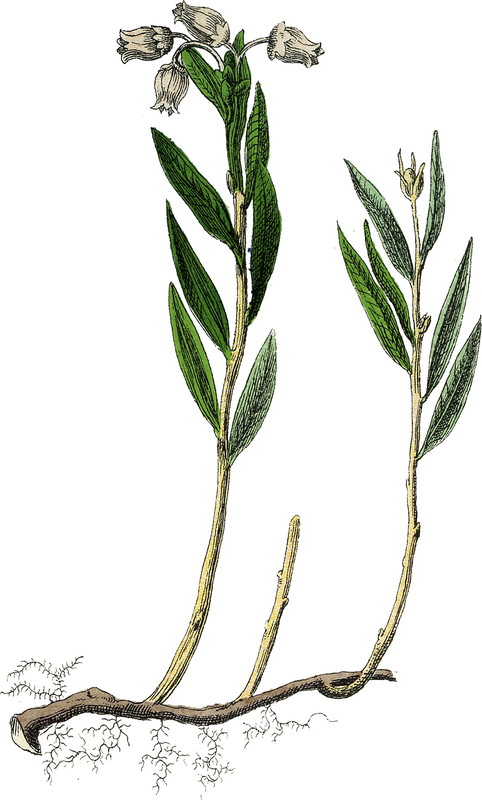 The stem has a cluster of green leaves and roots at the bottom. This Exquisite Vintage Cream Clustered Flower Botanical image could possibly be a butterfly orchid. The creamy five petal flowers are clustered around the top of the stem with several buds. Two large pointed leaves grow at the base of the stem. 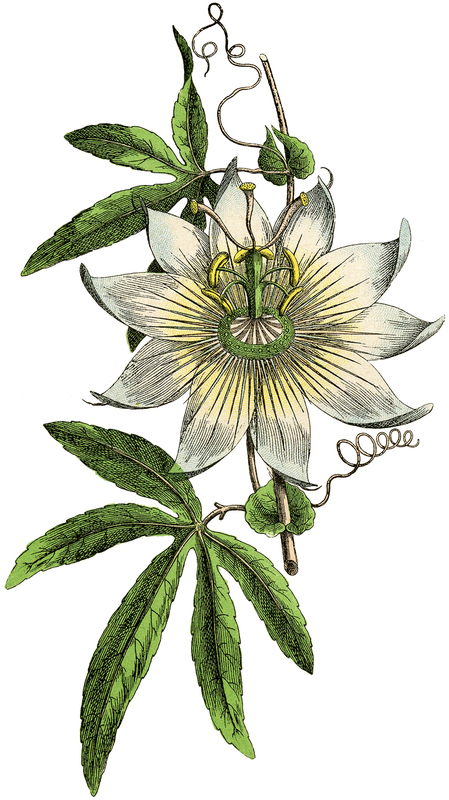 This is an interesting Vintage Tiny Bell Flowers Botanical image. 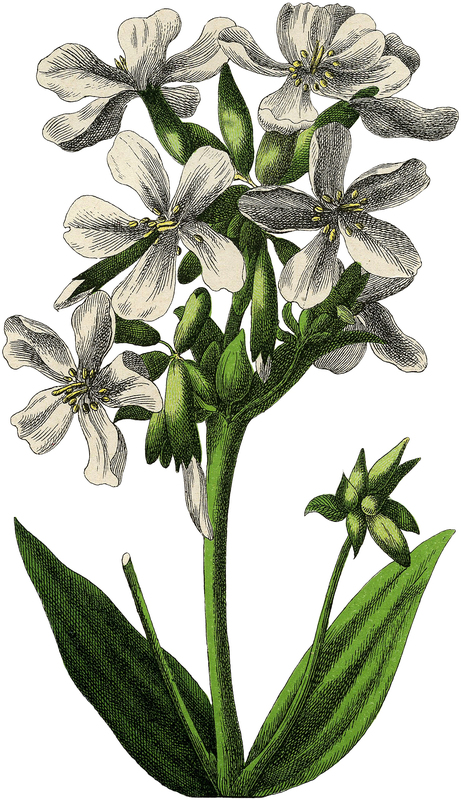 I love this drawing of a cluster of tiny bell shaped white flowers on a tall stem with many deep veined leaves. I am drawn to the root system at the base of the image. This Delightful Vintage White Starburst Flower Image of a large flower (possibly some type of orchid) is mesmerizing. 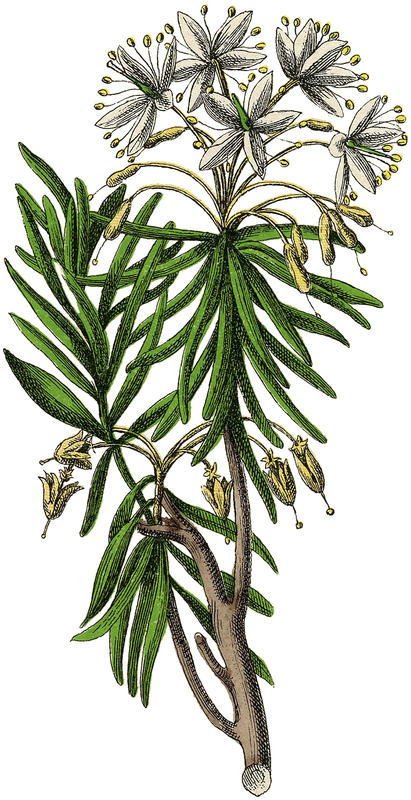 At the top of the botanical drawing is a cluster of creamy flowers with a starburst of yellow stamens with a ring of peanut shaped buds just beneath. From a patch of slim leaves bursts tiny yellow bell shaped flower-ettes on a woody stem. Shown here is a lovely, vintage Passion Flower Vine with Green Leaves. So pretty! Make sure you enlarge this to see the detail on this nice Botanical! This is a Charming Antique Narcissus Flower Image! Isn’t this so lovely?! Shown here is a very pretty Delicate White Narcissus Flower! The center is a bright cheerful yellow. I like how the flower is turned as if it’s having a look around! This is a pretty Delicate White Floral Botanical Engraving! 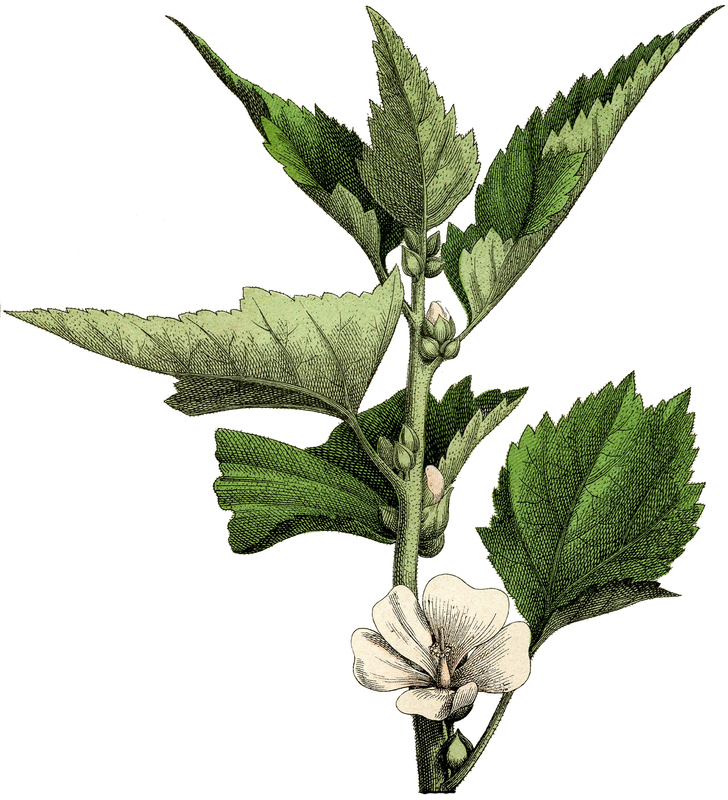 Shown here is a small pale creamy white blossom, with green leaves. Make sure you enlarge this to see the detail on this nice Botanical! We complete our White Botanical Flower Images collection with this stunning large Botanical Flower Image is an unusual looking blossom. The curly doodad in the center makes me think of Dr. Seuss! Perhaps it’s another type of Passion Flower? Make sure you enlarge this to see the detail on this nice Botanical! I hope you enjoyed this curated collection of 9 vintage White Botanical Flower Images. You might also like our Retro Violet Graphic Set HERE! Love this image – reminds me of growing up when my father had a passion fruit vine across the from of our (huge) old house. I’ve downloaded most of these — I love these floral images, especially the large one with such detail.